NATURAL PEST CONTROL WITH LADYBUGS. Beneficial ladybugs for controlling pests in your garden are the most popular and widely used beneficial insects for commercial and home use. Ladybugs are capable of consuming up to 50 to 60 aphids per day but will also eat a variety of other insects and larvae including scales, mealy bugs, leaf hoppers, mites, and various types of soft-bodied insects. Eggs are football-shaped and orange in color and laid in circular clusters of 3-20 on the underside of leaves. Each female can lay 10-50 eggs daily. 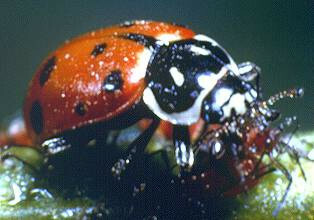 The larve consume up to 400 aphids at a rate of 50-60 aphids a day in later stages. If food supplies are short they will cannibalize each other. 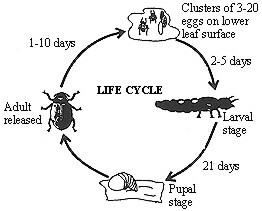 Larvae live for three weeks before pupating. RELEASE INSTRUCTIONS:When you are home, put the bag in a cool place (refrigerator) until late in the day or early morning. Do not release the ladybugs during the heat of the day or while the sun is shining. 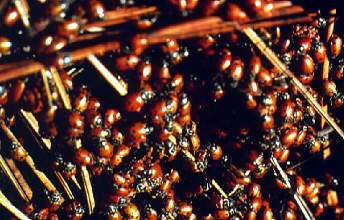 Sprinkle or irrigate the area before releasing, so the ladybugs will have a drink of water after their journey.